The Finger Control Mitts Restraint by Posey helps patients refrain from the urge of scratching, picking or interfering with catheters and IVs. Because it allows the fingers to be separated equally, it is less-restricting and gives the individual control. They are made from machine washable fiber, so they are easy to keep clean and sanitary. The mitts are easily secured with a loop strap, hook and connect strap, which helps limit the patient’s range of motion, when necessary. It comes with the option of being open or closed end. Open end has the ability to accommodate pulse oximeter probes, closed end is mesh covered and allows for simple skin checks. 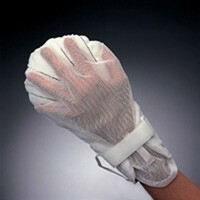 This restraint mitt is often used in stroke patients. It encourages individuals to use the affected limb by constricting the unaffected limp. Using the affected limb allows the patient to restore and regain motor function. They can also be used in combination with limb holders, such as the Posey Deluxe Quilted Limb Holder or the Posey Non-Locking Nylon Cuffs, which allows the patient to heal in a much faster time frame. Do the 2816 hand mitts contain latex? This item is latex free. I used this for my mother, who is brain damaged from enchaphalitis. She is constantly scratching and tearing at her skin, primarily on her face. The mitts stopped the behavior and actually seemed to calm her down. These open end mitts are not made of mesh (hand side), and they allow fingers to peep through at the ends, allowing one to see them. They are also washable. Good product, just took a while to receive due to the prescription issues. I ordered and emailed them immediately afterwards with the prescription, took about 2 weeks before someone contacted me requesting the prescription to be emailed again. It would be better to receive the "confirmation" email after the prescription has been reviewed by the company. order cancelled, order cancelled, order cancelled!!! I like the pillow concept but I worry about the strap and tightness around the wrist in order so it does not allow the hand come out. I also can not keep the fingers in the slots of the mitt. I like the pillow form it is soft but does allow the hand to come out if not tight enough around the wrist. I worry if I have it too tight around the wrist for the blood circulation. The plastic belt loop is hard and can irriate or hurt around the wrist and hand. Finger control mitts used for the adults with motion disabilities or cognitive that are generally at the risk of pulling out catheters or injuring themselves. The major advantage of the finger control mitt product is that it is secured with Velcro and it includes the connecting straps which help to limit the motion range whenever necessary. The finger control mitt is available only in two sizes and it fits all the adults. When the doctor informed me that I need a mitt for my husband, I thought it's kind of weird. He goes to explain how the mitt will be used, saying that I need to put it in his left hand as his right side of the body is the one affected by stroke. I did just that, and slowly I understood why he asked me to do that. My husband was forced to use his right hands to move! For about 2 months I put the mitt in his unaffected hand and I observed how he recover. Right now, he is completely able to move! I have a terrible habit of scratching myself so badly. I couldn't get rid of it my self so my mom got me this. Especially while sleeping my hands get out of my control and it made me have a lot of scars. Anyone who has the same habit as mine would need it. It's not stuffy at all. You can have good night sleep having wearing it of course.